Amanda Houston was born in Houston, Texas, and spent her childhood in North Brunswick, New Jersey. At the age of 13, her family—including her parents, Michigan natives Donald and Julie Stolt and brother Adam—moved to Ypsilanti. Houston, who wanted to be a teacher as long as she can remember, attended Lincoln Consolidated High School, where she participated in a cadet-teaching program. During her junior and senior year, she worked in a kindergarten class at Brick Elementary for an hour a day. It was her favorite part of the school day. After graduating in 2002, Houston decided to pursue her degree in elementary education. She studied early childhood education and reading at Eastern Michigan University, and worked as the aftercare teacher at Summers-Knoll school of Ann Arbor. 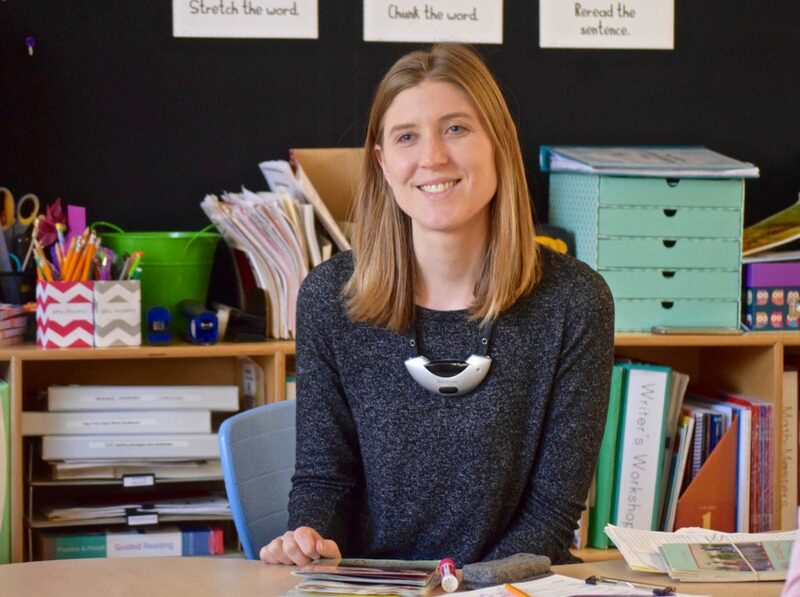 She completed her student teaching at Dicken Elementary in a third/fourth grade split classroom and then spent a semester student teaching in the 3-year-old room at the University of Michigan Children’s Center. She graduated from Eastern Michigan University in 2007 with a degree in elementary education with a minor in early childhood education and reading. Houston substitute taught in several Ann Arbor Elementary schools for a year before getting a teaching position at Dicken Elementary. Her first year teaching she decided to go back to school to pursue her master’s degree in learning disabilities. In 2009 she graduated from the University of Michigan at Dearborn with a master’s degree in education. 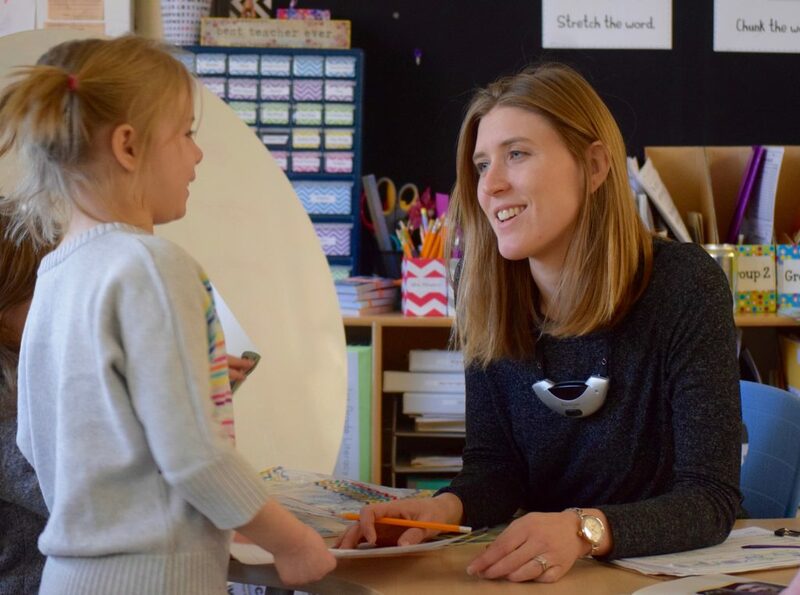 After two years of teaching half-time kindergarten and half-time reading intervention at Dicken, she moved to Bach Elementary where she currently teaches first grade. Houston provides literacy professional development for new teachers throughout the district as well as professional development related to guided reading, writer’s workshop, and benchmark assessments. Houston lives in Ypsilanti with her husband and two children. When she is not working, she enjoys spending time with family and friends, listening to music, reading, traveling, sewing, and enjoying the nature. What inspired you to become a teacher? As a young child, I remember playing school with all my stuffed animals. I would line them up and give them assignments, which I would then complete myself and grade. As I got older I enjoyed babysitting and helping out in elementary classrooms when I had a chance. My mother Julie was a paraprofessional in North Brunswick Public Schools in NJ. I would help out in her classrooms from time to time. I remember going to school before the start of the year and helping my teacher set up the classroom. I always loved school even though things didn’t always come easy for me. I had some amazing teachers who helped me learn good study habits and believed in me. Mrs. Bailey was one teacher that I will never forget. She took time to build positive relationships with her students and helped me realize that if I put in the hard work I could do anything I put my mind to. Teaching has been a passion of mine from a young age. I can’t imagine myself doing anything else. What’s the best compliment anyone could give you? When people come to my classroom they often compliment on how welcoming and organized my classroom is. I believe that classroom environment can make a difference in a child’s educational experience. I try my best to stay on top of putting things away as I use them and keeping my workspace clean. My students take responsibility for their own workspace by cleaning up at the end of each school day. In your 10 years in AAPS, what’s the most important thing you’ve learned about teaching? One of the many things I have learned in my 10 years teaching for AAPS is that as a teacher you have to constantly adjust your practice and make changes to meet the needs of your students. In this profession, each year is a new beginning with new challenges and adventures. I love building new relationships with my students and their families. There is always something new to learn as an educator. Describe an average workday. My work day usually starts at 6 a.m. I get myself ready for work and then get my children around. We grab a quick breakfast and coffee as we head out the door. I arrive at school between 7:40 and 8:00 am. Some mornings I have meetings or need to prep something for the day. The bell rings at 8:53. I stand at my classroom door and greet my students. Our morning starts with a quick activity and then a morning meeting. The morning meeting is a time to build relationships, welcome each other, review the day and work on literacy skills. Most mornings are filled with Reader’s and Writer’s Workshop. Afternoons are usually filled with math, science, and social studies. My day is non-stop teaching with a break for lunch and about an hour of planning on most days in the afternoon. During my planning time, I am meeting with my grade level team, prepping materials for lessons, making phone calls to families, or writing lesson plans for the following week. The school day ends with me walking my students’ out to meet their families on the playground. Most days I stay at school for about an hour setting up for the following day, attending building committee meetings or driving to another building for professional development. Some days I am running my own children to Rec & Ed activities before we head home. Once I am home I try to focus my time on my family. We have dinner and talk about how the day went. I help my older child complete her homework and get the kids ready for bed. I try to avoid bringing work home so that I can enjoy my family and have time to unwind. This is not always easy because there is always work to be done as a teacher. What advice would you give to a first-year teacher? Make sure to find time to unwind and take care of yourself. If you can’t get something done, it’s okay. There’s always tomorrow. Teachers have so much on their plates and it can be hard to manage everything. Find a system that helps you balance your professional and personal life. What’s the happiest part of your day? The happiest part of my day is when the bell rings in the morning and my students come into my room excited to see what I have planned for them. Favorite websites: Teachers Pay Teachers, Pinterest, Amazon, Mystery Science, Raz-Kids, and Epic. Apps you can’t live without: Pandora, Remind, and Seesaw. What do you know about teaching now that you wish you’d known that first year? My first few years, I found it hard to get everything done during the work week. I found myself bringing my daughter to school on the weekends to try and have everything ready for my students for the following week. I would tell a first-year teacher to take time to enjoy your friends and family and decompress from the week. It’s okay if you can’t get it all done. How do you keep students engaged? I keep my students engaged by being excited about the things I teach. If the teacher is enthusiastic about the curriculum, the students will be too. During whole group instruction, I make sure all students are participating by using boogie boards to record their thinking, and having students turn to another student and discuss their thoughts before sharing with the whole group. We do a lot of whole group responses after having a chance to work on something independently or with a partner. I use music and visuals to increase engagement and understanding. What is the most rewarding part of teaching? In first grade, students substantially grow both socially and academically. I love watching all the growth my students make throughout the school year, and seeing the light bulb go off when a student who has been struggling with a concept finally understands. It’s so rewarding to have former students come back to thank me for helping them love learning and school. What do you wish everyone realized about the work of a teacher? A teacher’s work never ends. Even if you have taught the same grade for 10 years, the students are new, the curriculum is changing, and teachers are always seeking out ways to improve their practice. Teachers find it hard to not work during the nights and weekends. Most teachers spend their summers teaching, tutoring, planning for the next year, and attending professional development. How do you recharge? By spending time with my family and getting a good nights sleep. What’s most exciting about your professional life right now? The most exciting thing about my professional life right now is being able to help train and coach other teachers in the district around literacy, and using assessments. This is so great! Amanda is an exceptional teacher! She’s one that will always be a standout for our family!